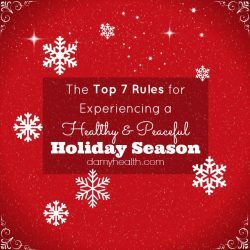 This recipe is perfect for the holiday season! Everyone in your house, from vegan to carnivore, will love this recipe. 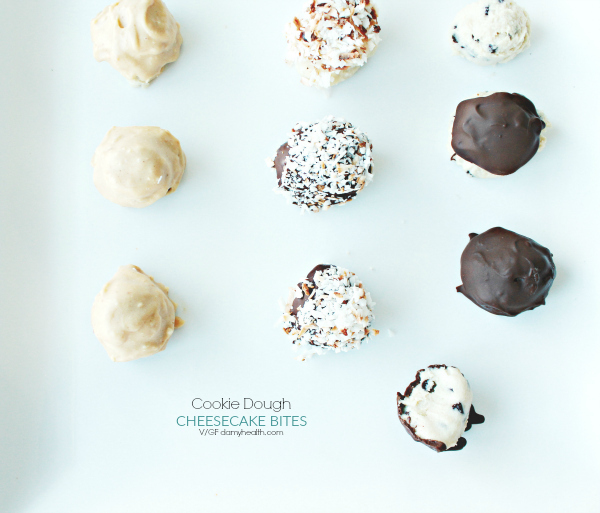 These cookie dough cheesecake bites are vegan, dairy free, gluten free, no-bake, high fiber, healthy fats and a wonderful party treat. 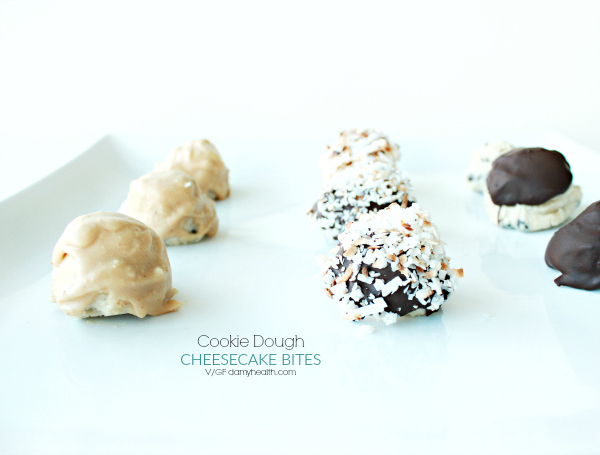 I love doing up a large batch of these cookie dough cheesecake bites and coating them in different ways. 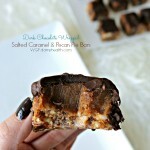 I will do half my batch in dark chocolate coating and half the batch with a peanut butter candy coating. 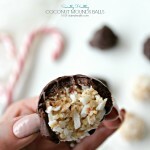 With some I will add the toasted coconut for those coconut lovers. 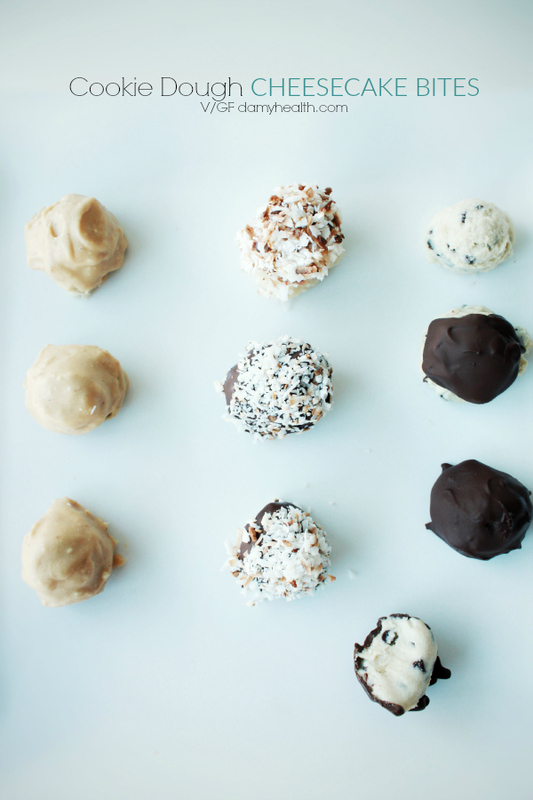 The cheesecake bites themselves are a smooth, creamy cheesecake and the candy coatings add a delicious crunch layer. 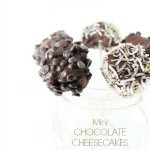 You can serve these as they are on a tray or you can add skewers for easy serving at a party. I hope that you enjoy this simple and delicious recipe during the holiday season! 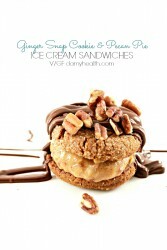 This recipe is gluten free, vegan, raw, dairy free, high fiber and packed with secret healthy ingredients. Add all Cookie Dough Cheesecake Ingredients to your food processor bowl (excluding the chocolate chips) and blend until smooth stopping to scrape down the sides. 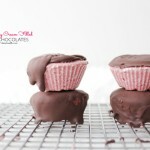 Fold-in chocolate chips with a spatula. 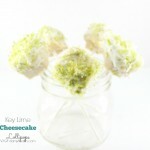 Using a melon baller (or regular spoon) scoop cheesecake balls onto your parchment lined baking sheet. Cover and place in the freezer for 4 hours-overnight. Place all peanut butter coating ingredients into the food processor and blend until smooth stopping to scrape down the sides. 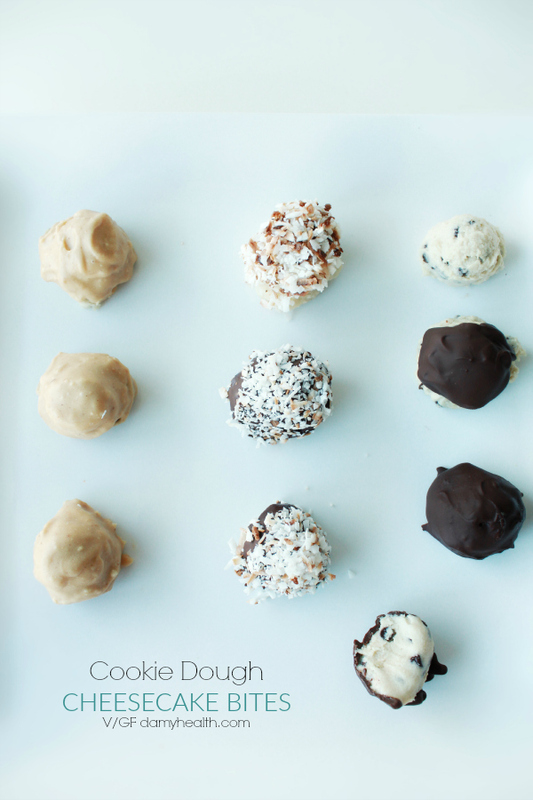 Place peanut butter coating into a bowl and set aside. 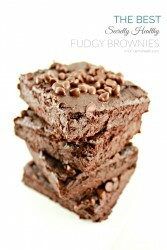 Do the same as above for the chocolate coating and set aside in a bowl for later. 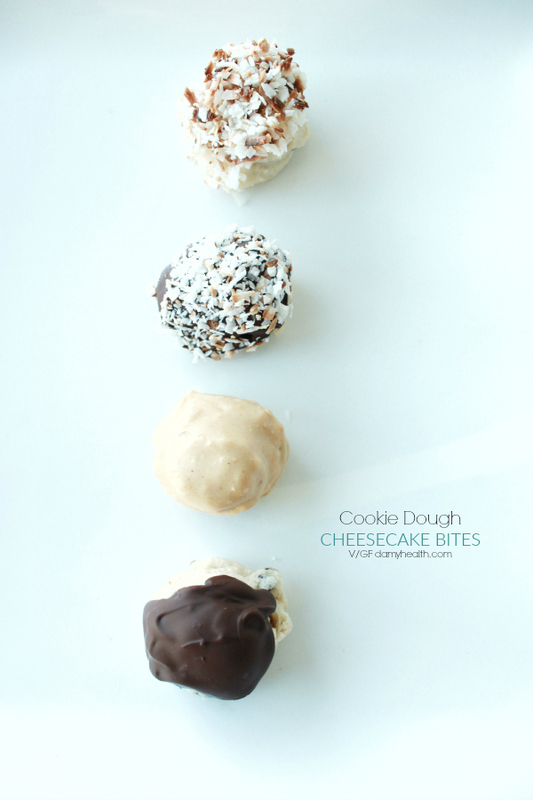 Remove cheesecake balls from the freezer and drizzle some with your Peanut Butter Coating and some Chocolate Coating. 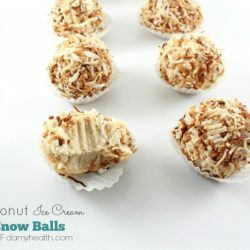 If you enjoy toasted coconut add to your cheesecake balls immediately after coating with peanut butter or chocolate coating. Tip - I place my cheesecake balls onto a wire rack and drizzle them with coating (with parchment underneath to catch the extra). 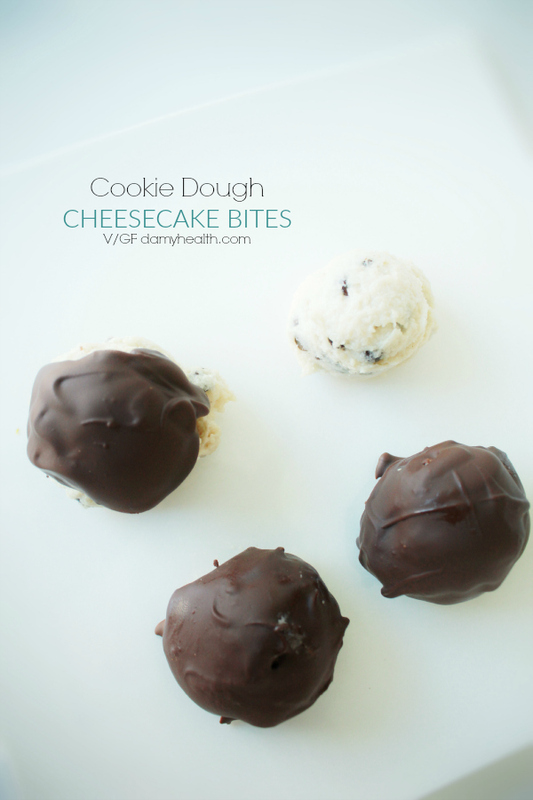 Place coated cookie dough cheesecake bites back into the freezer until you are ready to serve. Tip - If the weather is cold or your home is cold you may need to heat the candy coatings in a saucepan on your stove before using. Use the lowest heat setting, continue stirring and only warm for a few minutes. 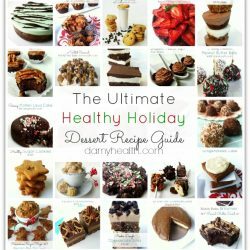 DAMY Members - A few cheesecake bites are a wonderful treat option.